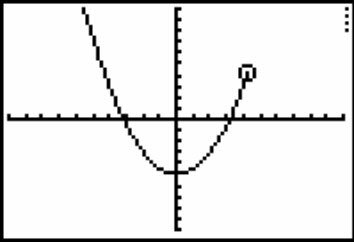 If you’re graphing several functions at once on the TI-83 Plus graphing calculator, it’s not easy to determine which graph each function is responsible for. To help clear this up, the calculator allows you to identify the graphs of functions by setting a different graph style for each function. keys to place the cursor on the icon appearing at the far left of the definition of the function. Repeatedly press [ENTER] until you get the desired graph style. You have seven styles to choose from. Each time you press [ENTER], you get a different style. Line, Thick Line, and Dotted Line styles: Y1 is set to the default line style. Y2 and Y3 are set to Thick Line style; and Y6 is set to Dotted Line style. Shading above and below the curve styles: Y4 is set to the shading above the curve style and Y5 is set to the shading below the curve style. The calculator has four shading patterns: vertical lines, horizontal lines, negatively sloping diagonal lines, and positively sloping diagonal lines. You don’t get to select the shading pattern. If you’re graphing only one function in this style, the calculator uses the vertical line pattern. If you’re graphing two functions, the first is graphed in the vertical line pattern and the second in the horizontal line pattern. If you graph three functions in this style, the third appears in the negatively sloping diagonal lines pattern, and so on. Path and Animated styles: The Path style uses a circle to indicate a point as it’s being graphed. When the graph is complete, the circle disappears and leaves the graph in Line style. The animate style also uses a circle to indicate a point as it’s being graphed, but when the graph is complete, no graph appears on the screen. For example, if this style is used, graphing y = –x2 + 9 looks like a movie of the path of a ball thrown in the air. keys to place the cursor on the equal sign in the definition of the function and then pressing [ENTER] to toggle the equal sign between highlighted and unhighlighted.